The Council on Foreign Relations established the General John W. Vessey Chair in Conflict Prevention in 2005 in honor of General Vessey, the former chairman of the Joint Chiefs of Staff. Made possible by a generous gift from CFR member Patrick M. Byrne, chairman of the board and president of Overstock.com, and his parents John and Dorothy, the chair was created to recognize the importance of conflict prevention in an increasingly complicated and dangerous world. The Byrnes made this gift to recognize Vessey’s contributions to the country over more than sixty years of public service and to call attention to a missing ingredient in the U.S. foreign policy debate: the need for a strategy for preventing conflict around the globe. The chair is held by the director of the Center for Preventive Action. John W. Vessey Jr. was born in Minneapolis, Minnesota, on June 29, 1922. In high school, he joined the Minnesota National Guard, and in 1940, his unit was called up to active duty. He served as an artillery sergeant in the 34th Infantry Division (Red Bull Division) and fought with distinction in North Africa, receiving a battlefield commission at Anzio. After World War II, Vessey attended the U.S. Army Command and General Staff College, the Armed Forces Staff College, and the Industrial College of the Armed Forces. He also graduated from the University of Maryland at the age of 41, and from the Army Helicopter School in 1970 as a colonel. Vessey served as the executive officer of the 25th Infantry Division in 1967 during the Vietnam War. Following Vietnam, Vessey served in Germany as commander of the 3rd Armored Division Artillery and then as Division Chief of Staff. In 1974, he was promoted to major general and commanded the 4th Infantry Division at Fort Carson, Colorado. He became a lieutenant general in 1975 and was made deputy chief of staff of the U.S. Army. In 1976, Vessey was awarded his fourth star and led the Eighth Army in Korea. He also served as the commander in chief of the U.S.-Republic of Korea Combined Forces Command and the United Nations Command. 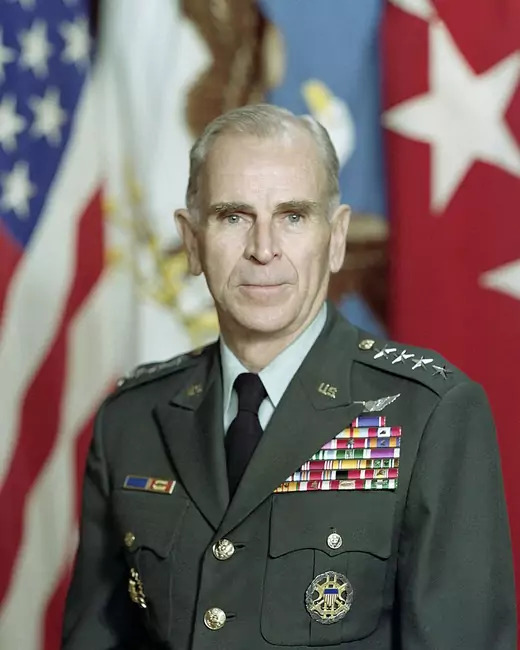 In 1979, Vessey became the vice chief of staff of the U.S. Army. In 1982, President Ronald Reagan made Vessey the chairman of the Joint Chiefs of Staff (JCS), where he remained until 1985. As chairman, he sought to improve global war planning, enhance the quality of the JCS’s advice to the president, and champion greater efficacy in joint operations.